Don't even think about pouring it down the kitchen sink. It’s hard to argue that bacon isn’t awesome, but the resulting grease is one huge hassle. It seems like an easy fix is to just pour that leftover grease down the drain. The garbage disposal and water can handle that, right? Wrong. You should never dump grease into the drain. Greasy drains create grime and clogs that haunt every plumber’s nightmares. To avoid shelling out hard-earned cash for drain repairs, follow these steps to dispose of grease in a safe and long-term way. 1. After you’ve enjoyed that delicious bacon, let the grease cool to room temperature in the pan that you were using, up to 1 hour. This will prevent any accidental spills that could leave nasty burns. 2. When the grease is sufficiently cooled, pour the grease into the empty jar. Pour the grease slowly to make sure you get as much as possible into the can. This step can get messy so place a paper towel under the jar. 3. Place the lid on the jar and set aside for next time. 4. 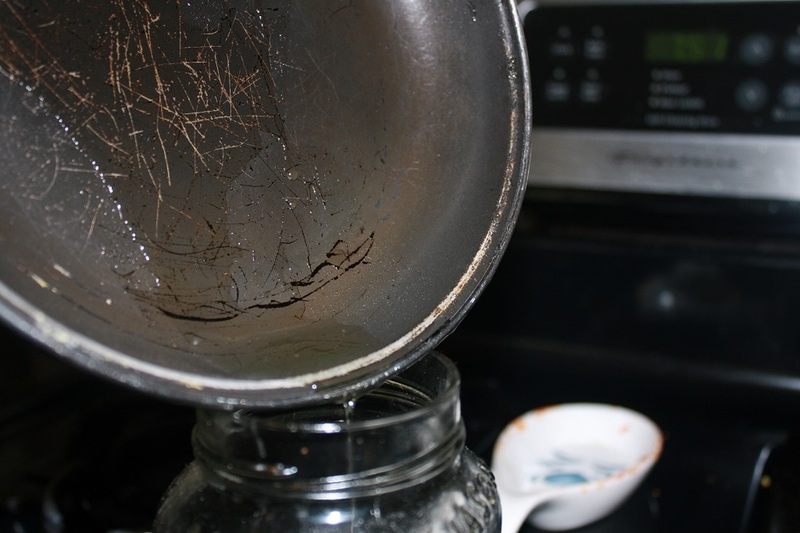 When the jar is full of solidified grease, you can toss it safely in the garbage.